Hereward takes a spring-time ramble around the pretty village of Crosthwaite to find blossom, sparkling streams and traditional white-washed cottages. This was the village that inspired the designs for the first range of Herdwick Landscapes’ 1/24th scale cottages. Each year Damson Day is celebrated upon Low Farm in the heart of the Valley. Originally a small local event to celebrate the damson and all its produce, it has now become a popular occasion, drawing in visitors from all over the country. Of course, it is not only the damson that blossoms in Spring: all along the river flowers bloom and trees come into bud. The village green at Crosthwaite. Here the road divides, one part following the River Gilpin, the other heading towards the village of Winster. Crosthwaite is a long village of scattered houses and farmsteads. School, pub and church all lie at intervals along the high ground that rises gently above the valley. Farms stand within the rolling green fields, connected by lanes and narrow tracks. Only around the tiny village green do the houses cluster together in a cosy mix of shared walls and interlocking gardens. An old cottage with a large outshut. The term outshut is typically a north country term and refers to an extension with a sloping roof at the back of the cottage. North Cottage in the middle of the village - two cottages snugged up together. On the lane leading up the Gilpin valley. For most of the year the damson is an inconspicuous twiggy tree of middling height. Yet, in April the buds break and the Lyth Valley is transformed with clouds of white effervescent blossom that appears around the farmsteads and in almost every hedgerow. The Gilpin is a modest stream that passes through some delightful countryside. In its upper reaches it passes through fellside and fields before meandering across the water meadows of the Lyth Valley. Interesting fact - the damson is so called because it is believed to have originated in the area around Damascus. Theories on how it got to Britain vary: it may have been brought back by the Crusaders or, even earlier, found its way here with the Romans. Spring lambs. 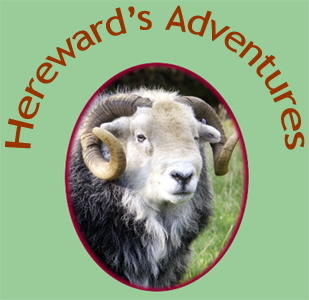 These are not Herdwicks. They are Rough Fells, another tough mountain breed popular in the Lakes. Their long, silky fleeces make them quite distinctive. And finally, Crosthwaite in the distance. This view is from the top of Strawberry Hill, looking across the Winster Valley, which cuts across the head of the Lyth Valley. Crosthwaite is the collection of tiny white cottages just visible in the far distance.